Green Genes Don’t Just Grow on Trees…! As a doting father and helpless gardening addict it would be highly unnatural for me not to want at least one of my little Wildlets to have more than a passing interest in plants and gardens. Obviously, it would be more financially prudent to focus their attention on golf or football but I was rather hoping that the ‘green gene’ might appear spontaneously without too much prompting from me. At the moment though, I have to report they appear more intent on emulating Wayne Rooney than Alan Titchmarsh – quite an alarming prospect for their grandparents! 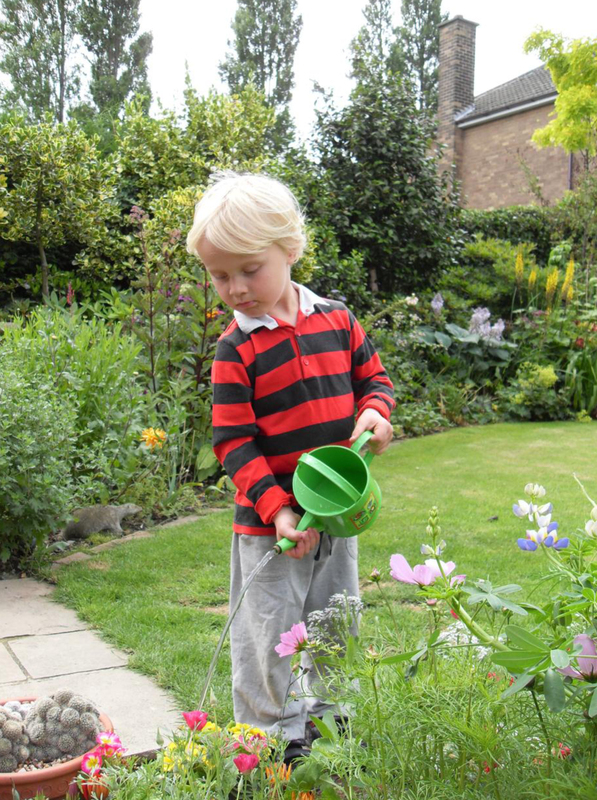 Salvation may be on the horizon though, because there is currently a national crusade to get kids more involved in gardening and the great outdoors being pioneered by the Royal Horticultural Society and involving every school in the country. Given the unpopularity of bankers and politicians, it is gratifying as a parent to see the next generation being sown the inspiration for either a future in the horticulturural industry or simply a healthy outlet for their energies out in their own gardens. Most schools have now taken advantage of the grants available to assist in teaching kids how to ‘grow their own’ and have come up with some fantastic plots where everyone can get stuck in and get their hands dirty – a bit like being a banker really! On the back of this a whole new horticultural industry has emerged with garden centres bedecked with a cornucopia of brightly coloured mini tools, wheelbarrows, watering cans, clothing, special children’s mixes of seeds, countless books, DVD’s and no doubt (I’ve not checked!) an App or two on how to become self-sufficient with mange touts in a hanging basket! Unfortunately I’ve yet to see any of these enticements lead to any potential signs of horticultural interest from my boys. Worse still, a painful encounter with a bee has recently put the kybosh on Olly’s interest in pollination – for the time being at least! Giant sunflowers, pumpkins, rude carrots (don’t ask! ), longest worm and hairiest spider competitions have all been tried with a modicum of interest, but to date their greatest excitement has been seeing a healthy bonfire and finding ‘stuff’ to keep it going. The problem with all this is the inordinate amount of parental supervision required and their inability to differentiate between dead plants and those happily minding their own business while flowering their heads off! I don’t know about green genes but certainly the smoke gene appears to have made the generational shift – as my parents would testify, their garden was the site of many a dramatic conflagration (even involving the fire brigade, but that’s another story!). Although I am clearly raising a couple of pyromaniacs, at least it gets them outside and the patron saint of bonfires, Guy Fawkes Esq, gives Wayne Rooney a bit of healthy competition on the role model front! Young Olly watering the flowers before his encounter with the sharp end of a bee. Jonathan Wild – Garden Consultant and Smoke Gene Carrier! Sutton Coldfield and all areas in B76 postcode. I’ve always liked the Desert Island Disc concept, the one where you get to choose just eight pieces of music to ease the sense of isolation as you while away your days alone on an island in the Caribbean – but I’ve always felt that unless you were lucky enough to get stranded with Mrs Crusoe (or Nigella Lawson) you’d need a bit more than Vaughan Williams to keep you sane. Well here’s my choice of eight flowers to compliment the music; clearly these are purely personal and if you’d rather take along some nice King Edwards and a couple of grape vines instead, then I quite understand! First choice is the Nerine, a bulb which has fascinated me since I was a boy. The fact it has a summer rest with no water makes it easy to grow and it always flowers around my birthday – September in case you’d forgotten! You don’t need desert island temperatures for the hardy Nerine bowdenii – try it, you won’t be sorry! Next up is the Azalea – not the most fashionable plant at the moment but one which is indelibly etched in my memory because many years ago I took a seed pod from a war grave in Germany. One of the resulting plants still flowers in my mother’s garden every spring and its powerful scent alone earns it a place on my list. The Iris family is vast but the big and bouncy tall Bearded Iris is my favourite. I have hundreds of varieties in my garden (the photo shows a few) so the big problem would be selecting just one to take to the island! Like the Iris my next choice would relish the hot, dry desert island conditions – Coronilla glauca is one of those special plants I ‘discovered’ by accident a few years ago. Now I can’t imagine a garden without finding a spot for this small growing shrub! Delightful! My next choice would not seem out of place on a desert island – the orchid – although the particular type I prefer would rather be stranded on top of a cool, moist hillside. The Pleione is a tiny little spring flowering species – another of my heirloom plants I have been growing forever and would hate to be without. Captivating! My last three choices I have grouped together as Marigolds, Sweet Peas and Roses. All of them are as indispensable to this stranded Yorkshireman as tripe and onions. And as for the choice of rose, it would have to be my dad’s favourite – Josephine Bruce – a gorgeous deep red colour with a fantastic scent. The next best thing to Mrs Crusoe! Garden Consultant and Up a Creek with no Paddle! Great Barr and the surrounding area’s.